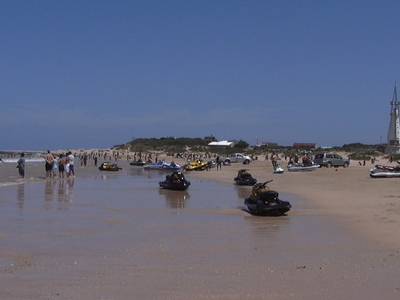 Jeffreys Bay is a town located in the Eastern Cape province of South Africa. The town is situated just off the N2 Highway, about 75 km southwest of Port Elizabeth. Jeffreys Bay is named after the senior partner of the firm Jeffrey & Glendinnings that opened a store in 1849 on the location where the town is today. Jeffrey is believed to be the first person to have settled there. Jeffreys Bay is one of the five most famous surfing destinations (no.2 on one "best in the World" surfing list) in the world and hosts the annual Billabong Pro ASP World Tour surfing event at Super Tubes during July. Spectators and professional surfers from all over the world flock to this event. In 2015, Mick Fanning was attacked by a shark two minutes into the J-Bay Open finals in Jeffreys Bay. Fanning was in the water with Julian Wilson during the final of the J-Bay Open 2015 when he was attacked by what is suspected to be a great white shark. Fanning punched the shark and tried to wedge his board between the shark and his body, and he emerged from the attack physically unharmed. A very long, fast, tubing right hand point break breaks along the west side of the bay. The break is regarded as one of the best right hand point breaks in the entire world, in both consistency and quality, in season. It has been divided up into several sections, including, from the top of the point, Kitchen Windows, Magna tubes, Boneyards, Supertubes, Impossibles, Tubes, the Point, and Albatross. "Supertubes", which itself breaks for about 300m or more, is regarded as the best part of the wave. On rare occasions (large wave sizes, wide-breaking waves, and even swells), Boneyards can link up all the way to the Point for a ride over one kilometre long. Optimal size is considered to be from about 4 to 10 feet (Hawaiian scale), or about 8 to 20 feet wave faces. The most consistent waves occur between about May to mid September, also often coinciding with offshore winds, although good waves can occasionally occur at other times of the year. The initial discovery and promotion of the wave is curious. Another nearby right hand point wave at St. Francis Bay was first idolised and promoted in the cult classic surf movie The Endless Summer in the 1960s (although both Jeffreys Bay and St. Francis Bay were probably surfed much earlier). Surfers who travelled to the area soon stumbled upon the nearby Jeffreys Bay surf break, which was found to be not only a faster, more powerful, and hollower wave, but also much more consistent. Here's the our members favorite photos of "Towns & Villages in Eastern Cape". 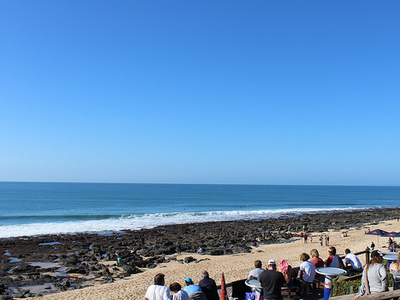 Upload your photo of Jeffreys Bay!